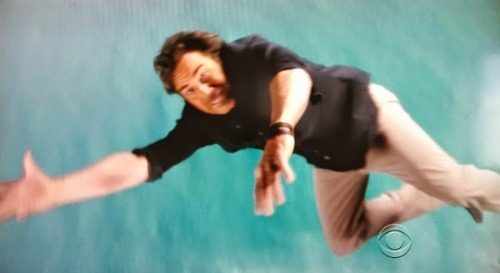 The Bold and the Beautiful spoilers tease that Ridge’s (Thorsten Kaye) willingness to break the law will put him in danger. Bill (Don Diamont), who committed a moral crime not a legal one, will have a legitimate charge to make against Ridge if he wants to. Bill told Steffy (Jacqueline MacInnes Wood) that he had no issue with Ridge. Of course he didn’t know that on the same day Marone took a six-pack of bottles to Liam (Scott Clifton) and encouraged him to file legal charges against his father. Those charges would falsely claim that Bill had imposed his will upon Steffy during the now infamous night at the Forrester guest house. Ridge told Bill what he intended to do after punching him in the face. Bill seemingly dismissed his mortal enemy’s words as part of an emotional rant. But they weren’t that. Instead, Marone intends to have Bill jailed for acts he didn’t commit. Filing charges that one knows are false makes that person guilty of a crime. Yes, Marone is being referenced and he’s being referred to by that name because it rightly evokes his real father, Massimo (played by the late, great Joseph Mascolo), who was a shady character. The dirty apple apparently doesn’t fall far from the tree. Oh Bill’s detractors are right to say that he’s no saint. That type of retort can’t be denied. Yes, Bill arranged for Ridge to fall out of a helicopter. However, while all past issues can be cited, they can’t be used to change the fact, not opinion, that Bill committed no crime on the night that involved Steffy. Ridge is obviously trying to rationalize that his daughter willingly chose to share her passion with Bill. To Ridge that doesn’t compute. So, Steffy had to have been taken advantage of by that scum Bill. Telling the authorities that Bill violated Steffy will become a point of legal contention. If he’s locked up due to false claims Bill will have an issue with Ridge. Bill will strike back by proving that Ridge filed false charges. Even Liam, who now hates his father, wouldn’t go along with Ridge’s desperate plan. He recognized that his soon-to-be ex-father-in-law wants to believe in this scenario, but it’s not the truth. Liam’s principles, that Bill railed against in the past, will actually help him in this instance. Steffy is the only person who will be able to prove that Bill is innocent. Ridge doesn’t appear to realize that if she comes to Bill’s rescue, Bill’s feelings and possibly Steffy’s, will be affected. That’s right, Ridge’s actions could serve to push Dollar Still closer together.